My friend and with her friends arrived to Maastricht at 10 o'clock in the morning, so we had time to see a bit of the city and find a good spot for watching the parade. I told them how to get to the city centre and went home for my camera and a red suit. Maastricht was still empty, but you could already see people in costumes. We met in a fast food restaurant because shops were closed and they were hungry. Sashka had paint for face so we decorated our faces a bit and entered the city. People were moving to Vrijthof first so did we. It was amazing, that really everybody was dressed and you could see that people put a lot of effort into their costumes. We took some pictures and I decided to show them a bit of Maastricht before we will see the parade. Some parts of streets were empty, but as far as there was some pub, people were standing around and drinking beer. I showed them SBE, library and "small zoo". Weather changed and it started to show quite heavily. Better than rain. We moved back to the city and found an empty space and also a small shed near the oldest bridge where the parade should go over. The streets were prepared for the parade – foot-paths were separated from the roads by metal fences, so the parade had a free space. We could see groups of people going to the direction of the train station, where the parade was about to start. 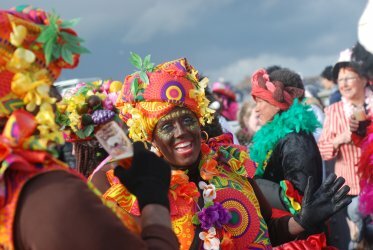 Carnival parade started at 13:33 near the train station and headed to the city centre – over Market and end up at Vrijthof. The only negative thing was the weather – it was cold and rained from time to time. But this didn't matter to the people in the parade, actually the whole atmosphere was great, people were enjoying themselves. It was impossible to make picture of everyone as also a lot of people in costumes were just passing by on the side-walk. 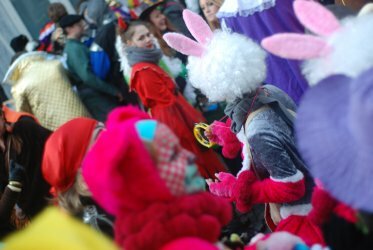 The whole city became full of people in various costumes and different kind of music. Strange about the brass music is, that you would never want to listen to it for so long time, but together with the costumes… it just fits together. 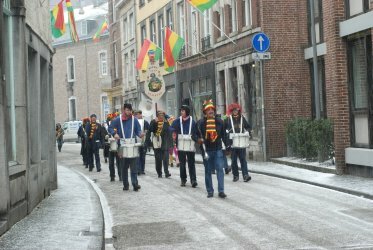 People in the parade were also playing various music instruments so it was not only music from CD, but live music too! We watched the parade for about 2 hours and than we were just too frozen, so we needed to find a place to sit and grab a cup of coffee. We managed to do it at cool place near the river, so we still could see the parade. Funny thing is that you are sitting in a coffee house and other people are also in costumes Visitors from Brussels left for train home at about 16:30 so we seen that the end of the parade crossed the Sint Servaasbrug at 16:40! Incredible! Then I met my friend from Master's Introduction day and her friend and we went along the parade to the city centre. Vrijthof where the parade ended was not crowded – meaning people were not standing there, but they moved to the bars and pubs in surrounding streets and were partying. It was impossible to find a place where we could fit in, so we moved back to the Market where we were luckier. We got into a club with super DJ, who was playing "carnival music" as well as some "pop music hits". At 7 we decided to leave the club and go home to grab some dinner and meet again later on. This time we also met Sabine with her Boyfriend and another guy. We decided to try the Platierstraat – well, not that a good idea. Everything was mega crowded, even going though was sometimes impossible. So we ended up in the Alla. The only problem was, the music was not any longer of carnival mood, but just pop hits. So after some time we moved to another place near river. The music was fine, but we were the only young people there What the hell we wanted to enjoy the carnival mood. All around this whole day was awesome. 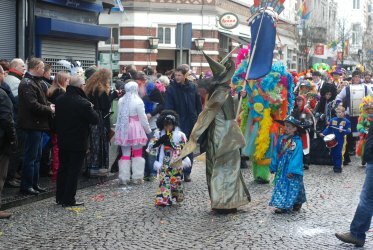 I like the way people in Maastricht celebrate carnival. It's time to have fun and go out with friends, wear costumes and enjoy life. It's about the spirit of it you know. You will not enjoy carnival that much if you go there alone without costume just to watch it. It is interesting, but to fit in, wear something and if you really want to enjoy, take your friends with you. In Maastricht you could see people of every age to take part in the event and later on in every club, bar or pub people were dancing no matter how old they were. You listen to that creepy Dutch music but you kinda like it, feel the moves. Article last edited 25. 2. 2012, viewed: 1545-times.